Place the water, konbu, and bonito flakes in a saucepan and bring to a boil over medium heat. Once the water is boiling, reduce the heat to low and cook for another 5 minutes. Pour the broth through a strainer lined with a paper towel and set aside. Combine the ingredients in a stockpot, cover, and bring to a boil. Loosen the cover and let simmer for an hour or two. Discard the vegetables, pour the broth through a strainer lined with a paper towel and set aside. Heat up a few dashes of olive oil in a large saute pan on medium-low heat, and saute the shallots for several minutes, then add the shiitake mushrooms and chard stems and cook for several more minutes. Stir in the finely chopped chard leaves and parsley. As the vegetables start to dry in the pan (you will feel them start to stick to the bottom of the pan), stir in a ladle of the mushroom broth. When the broth has cooked down, add another ladle-ful. Add in the finely chopped pine nuts, turn the heat all the way down, and cook, covered, for a couple more minutes. Turn off the heat, stir in the cheese, taste for salt, and let cool. Boil the beet (or chard) leaves for 4 minutes, drain, let cool, and then squeeze out as much of the liquid as you can. Very finely chop. Knead the dough for 8 minutes on a dry work surface: steady the dough with one hand, and push down and forward with the heel of the palm of your other hand. Fold the now-stretched dough back in half, give it a half turn (always in the same direction), and repeat. Cut off one sixth of the dough (Marcella says that “the pieces of dough you end up with for thinning should be three times as many as the eggs you used“), and keep the rest of the dough wrapped in plastic wrap. Thin the dough, and start working it through the pasta machine from the widest setting until you are happy with the thickness (I went to setting 8). The strip of pasta should be about 3 to 4 inches wide. Cut the strip in half, and place small mounds of the filling about 2.5 inches apart. With a pastry brush and a bowl of water, gently moisten the pasta around the filling, and then place the second half of the pasta strip on top and press around the filling. The water helps create the seal. Then with a knife or pasta cutter, trim the pieces of ravioli and place on a dry, clean kitchen towel. Repeat these steps until you have made all the raviolis. Bring a large pot of salted water to boil, for cooking the ravioli. Place the reserved dashi broth in a saucepan and add a cup of the mushroom broth, the soy sauce, the mirin, and a small pinch of salt. Bring it to a simmer. Place the ravioli in the boiling water and cook for 5 minutes. 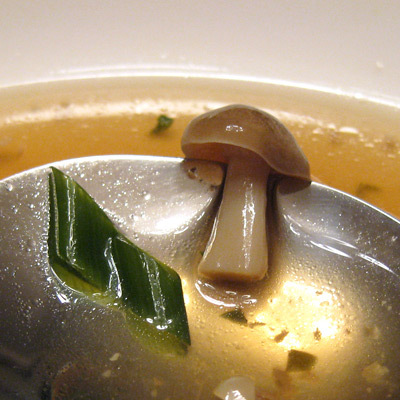 At the same time, place the chopped scallions and the shimeji mushrooms in the simmering broth, and cook for 4 minutes. 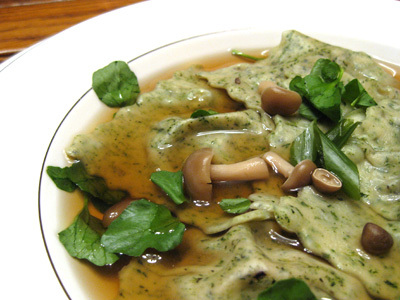 Lay out your bowls for plating and place a bunch of watercress leaves at the bottom of each bowl. During that last minute before the ravioli is ready, ladle out a little broth and half of the scallions and shimeji mushrooms at the bottom of each bowl. 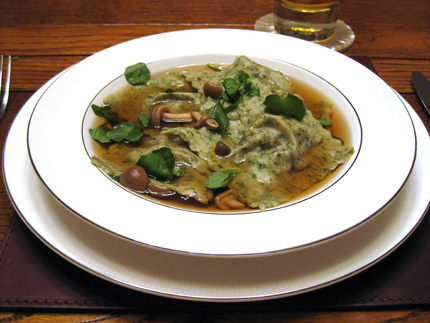 With a slotted spoon, distribute the ravioli among your waiting bowls, and then top off each bowl with the broth and remainder of the scallions and mushrooms. Serve and enjoy! I paired this with Sapporo beer. For dessert, we made a blackberry and raspberry version of Food Blogga’s sour cream version of the raspberry cake from Gourmet many people have tried this summer (including us). I think I liked Susan’s sour cream version better than the buttermilk. Topped with some lightly sugared whipped cream, it was absolutely delicious. What a beautiful and creative effort. I have that model of pasta roller/cutter. You are inspiring me to bring it out. It’s been collecting dust for a while. Time to give it a spin. The last time I made ravioli, I cheated and used wonton wrappers. 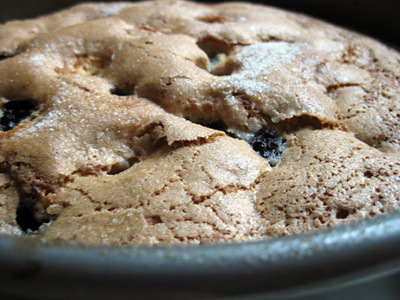 Yay, Giff is back on the food blog! Good eating ahead at our house! Seriously, this was a great dish. I love it when Giff decides to try 6 new things at once and it works! I am with Lisl, looking forward to good cooking again at the Gratin househould! (I mean Giff household!). Beautiful dinner, that I am certain took all day. Those are always the best meals! I love sour cream in cakes almost as much as buttermilk. All looks delicious, as always. Summer is almost over, get crackin’! It took some time, but not too bad. 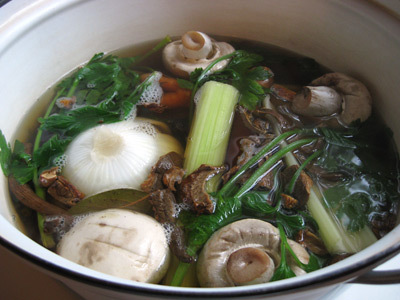 The dashi broth takes 20 minutes and the mushroom broth is a snap to throw together and then you can just leave it lightly simmering on the stove. Making the pasta for the raviolis took a bit longer than it needed to because I’m not that practiced a hand at it yet, but by god using a pasta machine is so much faster (and with much better results) than trying to roll your own thin pasta out! Yay! Giff got himself a pasta roller. I had better results on this pasta machine than on more expensive models so i like it a lot. And look at you going easy, breezy, Japanesy. 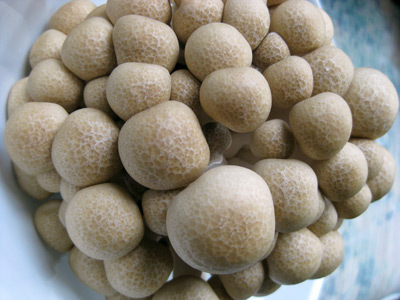 This is a great dish and the dashi/mushroom broth sounds awesome. Bravo Mr Constable! Bloody hell Giff, I go away for two weeks and when I come back your pictures and recipes have skyrocketed in every single respect! What do you eat for breakfast?! I want that kind of mojo! Sorry to hear about the startup, but well done on the pasta! I second the earlier comment – I go away for a few weeks and come back to find you’re all kinds of fancy.